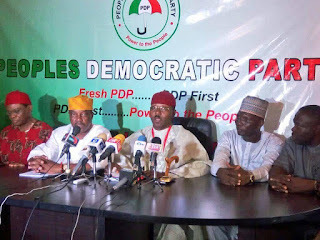 Some aggrieved members of the Peoples Democratic Party, PDP, on Wednesday, announced the emergence of a parallel Peoples Democratic Party, PDP known as “Fresh PDP,” in Abuja. The group said the emergence of the Prince Uche Secondus’ led National Working Committee, NWC, at the December 9 national convention will not stand. They said the “Fresh PDP” is the authentic party. Members of the new PDP were said to be loyalists of one of the chairmanship candidates in the recently concluded convention of the party. The group, led by Emmanuel Nwosu, is calling for the nullification of the party’s convention held on December 9 at the Eagle Square in Abuja. Briefing newsmen at the party’s secretariat located at Tito Broz street, off Jimmy Carter street, Asokoro, Nwosu said the process leading to the emergence of the Uche Secondus-led National Working Committee was fraught with illegality and abuse of electoral process.